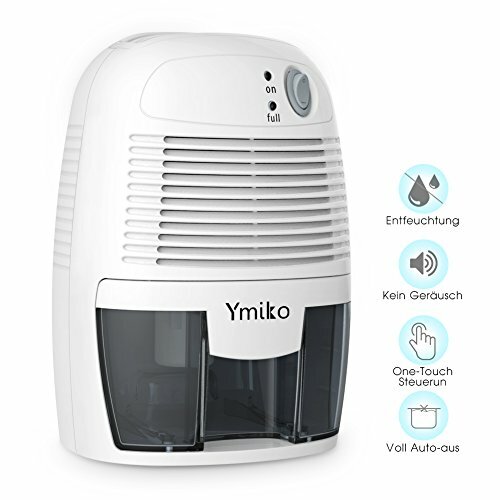 Mini Dehumidifier for Home: Designed W/ 500 ml capacity tank extracts up to 250 ml of moisture daily making it great for small size spaces such as in RV, caravan, closet, boats and bathrooms. Also the perfect unit for camping, traveling & more. Whisper Technology & No Compressor Needed: lower than 35dB, with no annoying sound, offer quiet and sound sleeping.Thermo-Electric Cooling is absorbing the moist out of the air and binds into the unit so you can breathe easy and get more restful sleep. Auto Shut Off Feature: Ymiko Electric dehumidifier has auto shut off feature to save power and safe when full with LED indicator to remind you. Just remove the water tank after quick and easy and put it back in. All done in less then 10secs and start our air dryer again. Effective Up to 1200 SQ FT & Low Energy Consumption: Supports an extensive 1,200 Cubic Feet working range which makes it a great small space. With only 20W energy consumption,it is an ideal environmentally friendly solutions for absorbing damp and condensation. 1-Year-Warranty & FCC Certified: Backed with CE certification and a Ymiko 1-year extended warranty when you register your home dehumidifier, you can rest assured that it will be protected. Includes Ymiko branded dehumidifier for optimal performance.